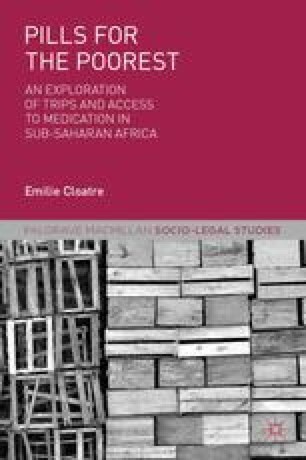 In this chapter, I question the links between the existence (or absence) of pharmaceutical patents in written national law and the role of pharmaceutical patents in ordering the local pharmaceutical market of Djibouti. I explain why the set of regulatory forces that shape the market cannot be deduced fully from the absence of intellectual property (IP) in the legal landscape of Djibouti until very recently, and why the absence of engagement of public health actors with patents cannot be interpreted as meaning that they are fully irrelevant to the way in which the market for drugs is shaped. I argue throughout that patents in Djibouti have in fact always been highly influential and can be conceptualized as silent regulatory tools with fluid jurisdictional boundaries. In this analysis, I position my understanding of regulation at the crossroads between actor-network theory’s (ANT) approach to analysing processes of social ordering (Latour, 2005; 2010) and recent approaches in regulation theory that have emphasized the increasingly fluid and decentred nature of regulatory forces (Black, 2001; 2002; Scott, 2004). The discreet but influential modes of action of patents in Djibouti invite one to reflect carefully on the role that patents may play in public health systems aside from their official role, and what this may mean for the ways in which the markets of states that do not or did not protect pharmaceutical patents may have been shaped.